Hours are Monday - Friday from 7:00 a.m. to 6:00 p.m. Blessed Assurance Adult Day & Health Care Services, Inc.gives you peace of mind by taking care of your loved one with kindness, warmth and encouragement. Sometimes it is difficult to decide what level of care an elderly or handicapped person needs. It is always helpful to talk to a caring and experienced adult day care and health services professional who is experienced in the aspects of adult care. 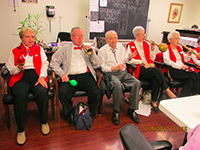 Our goal is to preserve the dignity and enhance the quality of life for those we serve through a caring, stimulating, therapeutic and enjoyable environment.